Posted November 16, 2015 by Tim Lepczyk & filed under House. 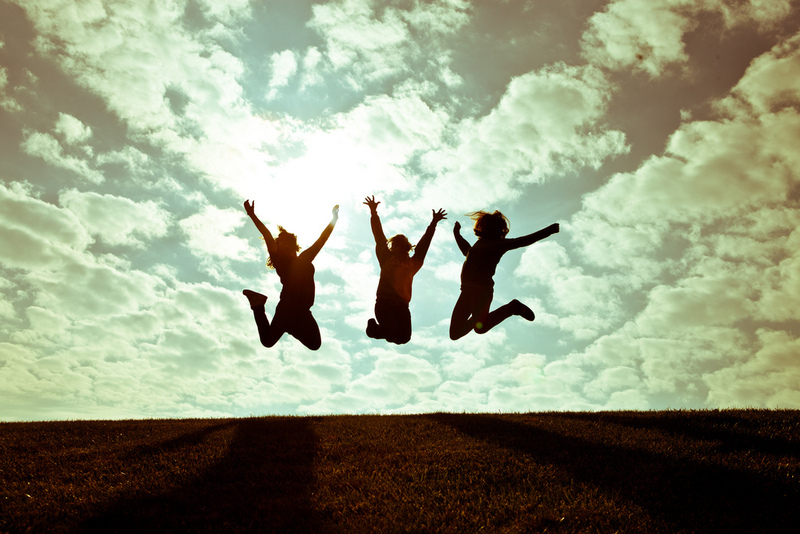 What fills in the gaps in a relationship? Grout, of course. Posted September 8, 2015 by Tim Lepczyk & filed under House. 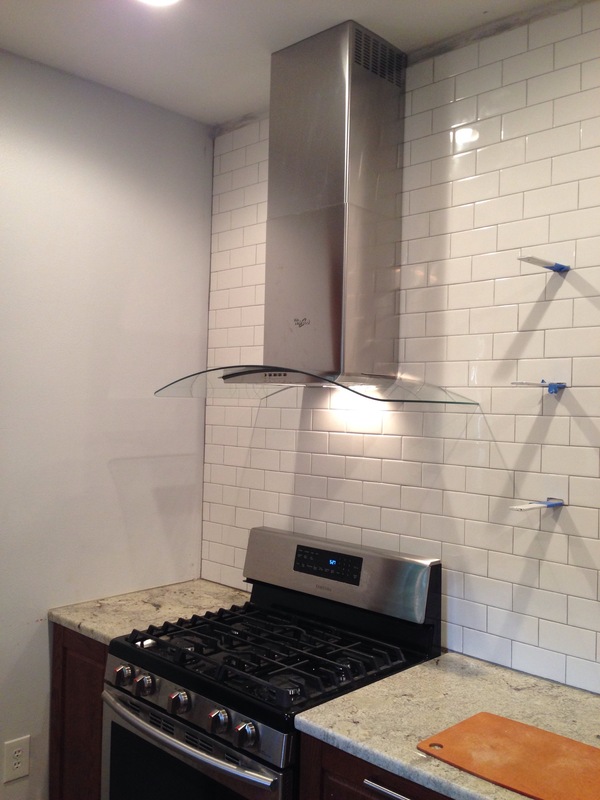 It’s not vented outside yet, but the hood is installed and our kitchen feels that much more complete. Posted September 3, 2015 by Tim Lepczyk & filed under House. Today, while home with a sick S—, Gene tiled the rest of the wall. Brackets are in for the open shelves. 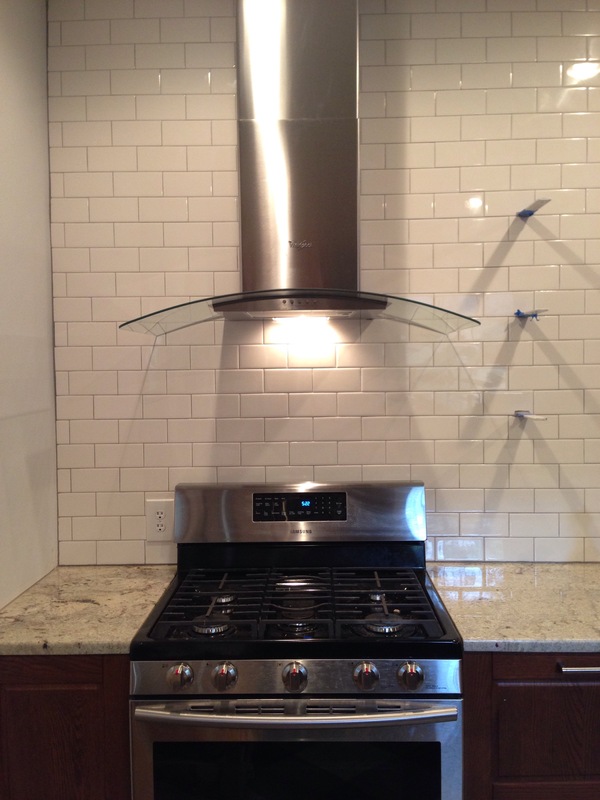 Next up, after grouting, is to install the hood. Posted August 24, 2015 by Tim Lepczyk & filed under House. 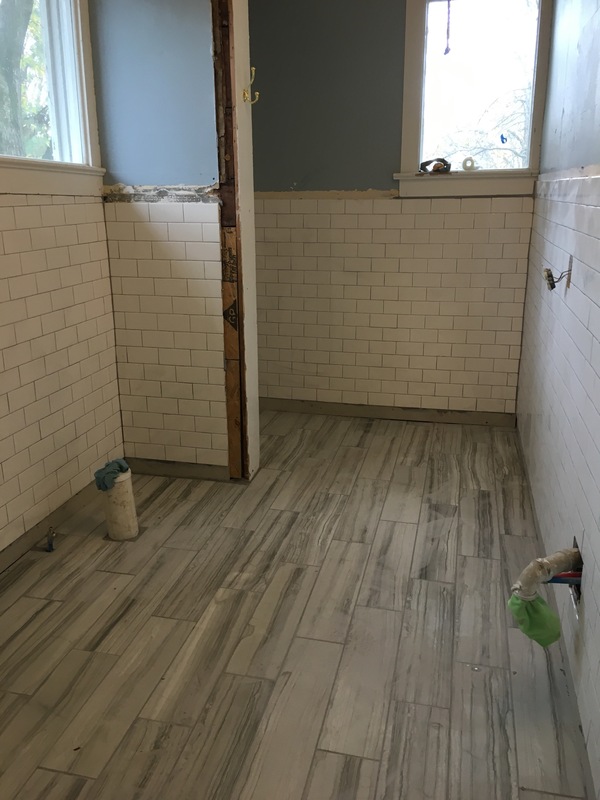 Last week saw another call to the plumbers regarding their work, removal of the bathroom floor (Thank you, David), countertops being installed, and lost dishwasher parts. 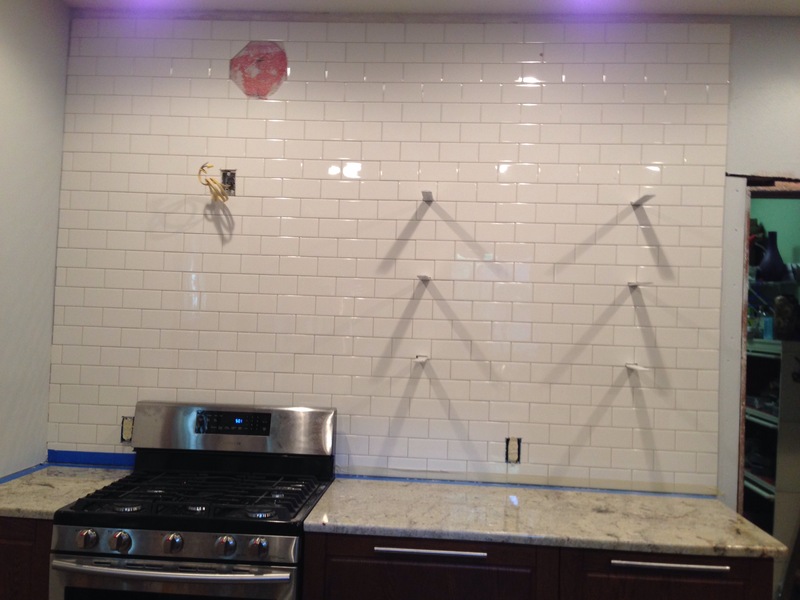 Today, some tile went up on the kitchen walls and it’s looking good. 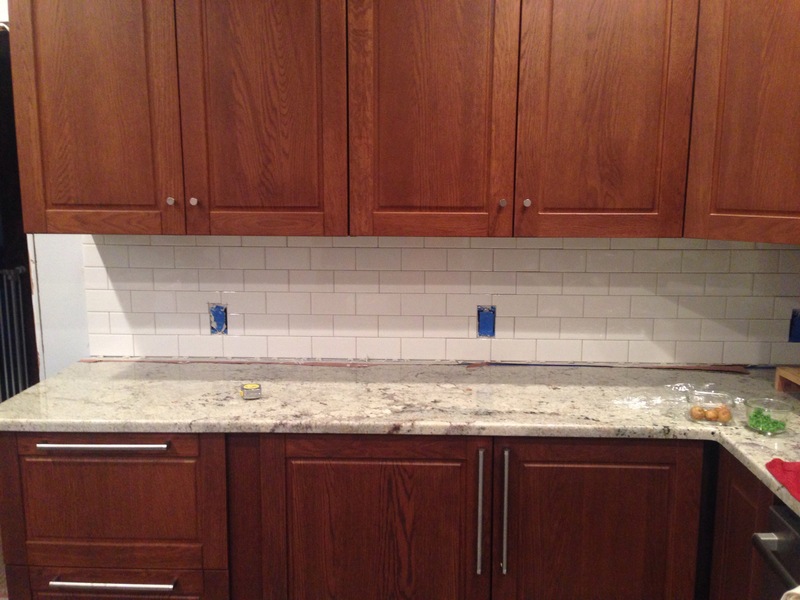 Subway tile waits to be grouted. Posted August 13, 2015 by Tim Lepczyk & filed under House. The countertop guys came out again and have a solution. We will cut into the base cabinet but not all the way through it. Just enough to get the sink in. And, we’ll probably still strengthen one side. Super happy and hoping we get back on their install schedule soon. Posted July 30, 2015 by Tim Lepczyk & filed under House. I’m beat. 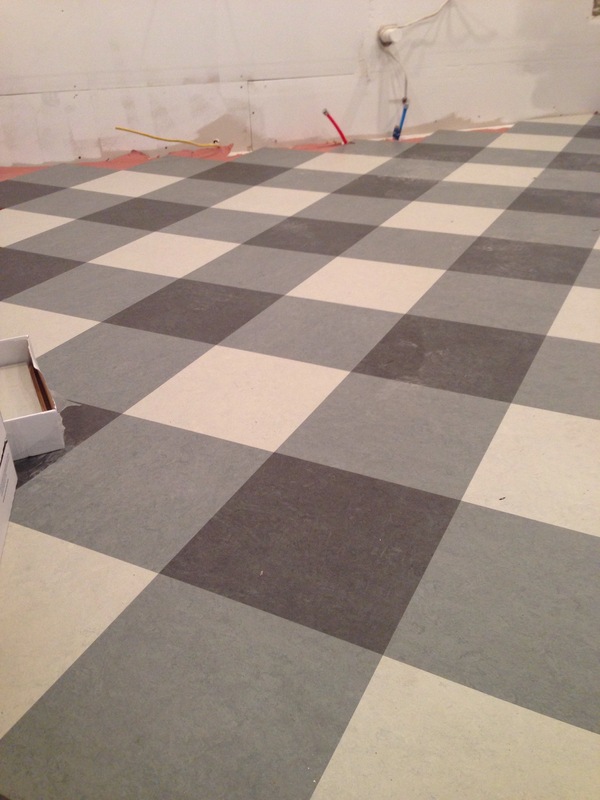 Just got back to our friend’s house after an evening of installing Marmoleum, which is the flooring we picked. Half of the kitchen is covered. Thank you Mark and Brent! 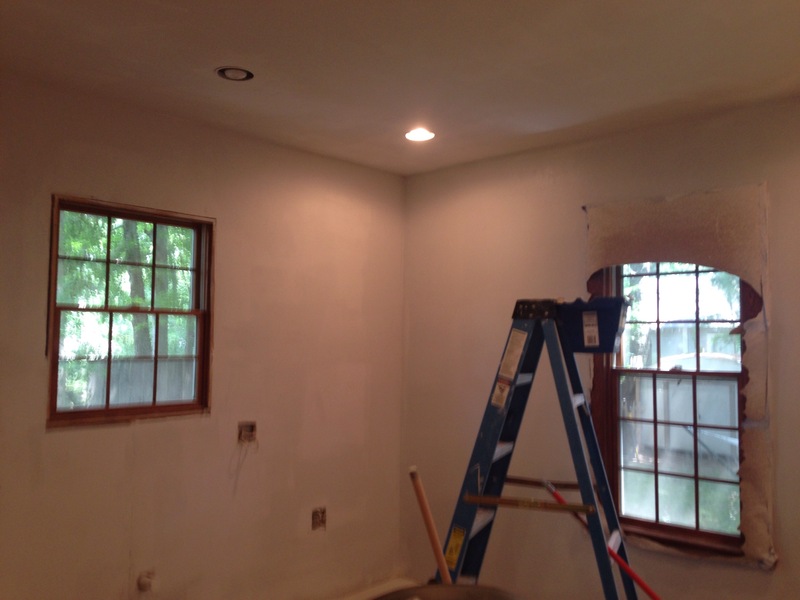 The walls and ceiling are textured and painted. 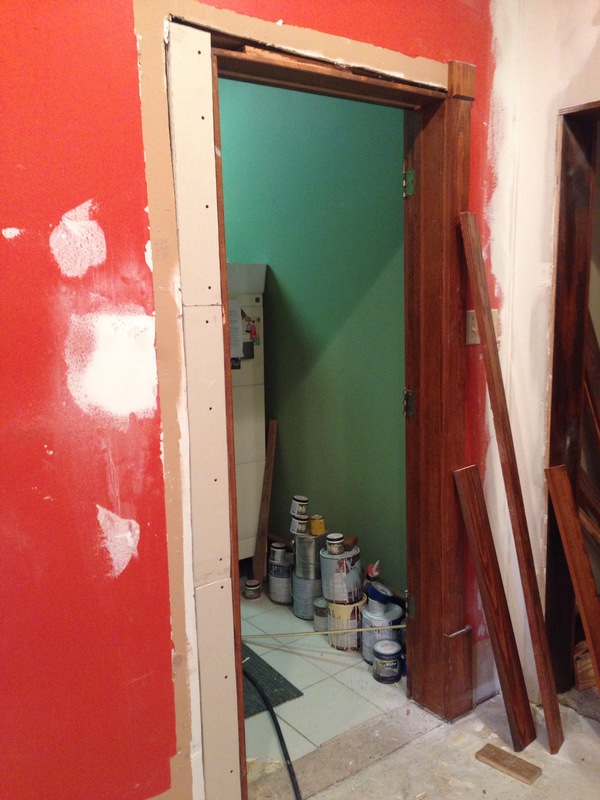 We extended a wall and narrowed a door. Tomorrow, we’ll get the flooring finished and some cabinets hung. This door was four inches wider. Wish us luck. Drop off prepared meals and beer. Lend a hand and hopefully the next post will show even more progress. Posted July 24, 2015 by Tim Lepczyk & filed under House. 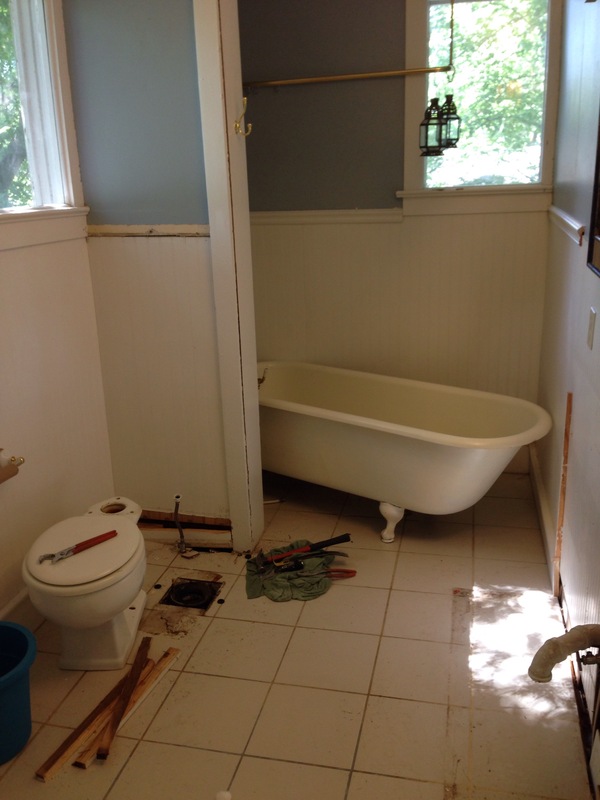 Please Lord, give me the strength to endure subpar subcontractors. The plumbing is finished and our schedule was blown apart by plumbers who didn’t show up and never called to say they weren’t going to show up. Also, they failed to make the drain stay above the ceiling, so we had to build a box around it. 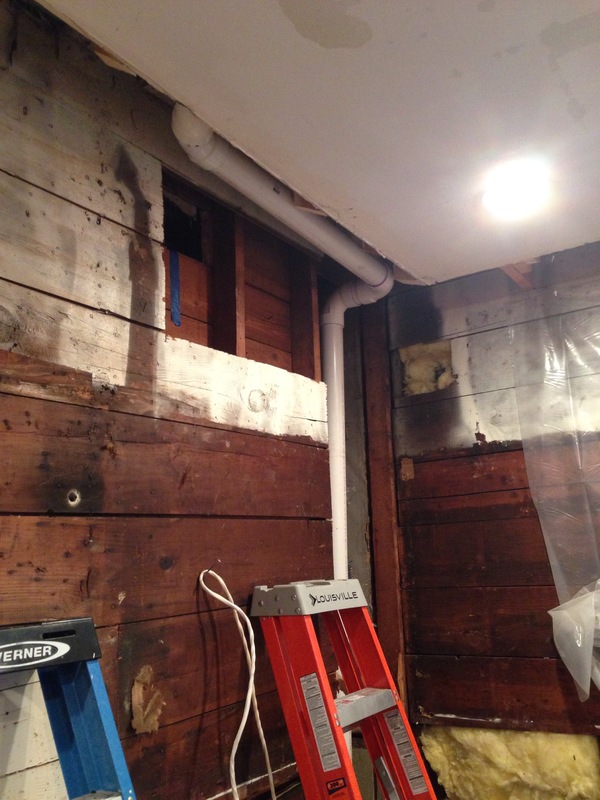 I need to remind myself that we no longer have a pipe running down the wall, which would have involved cutting cabinets and jury rigging some method to hang the cabinets. Still, lack of communication and inability to meet expectations has made this a disheartening process. 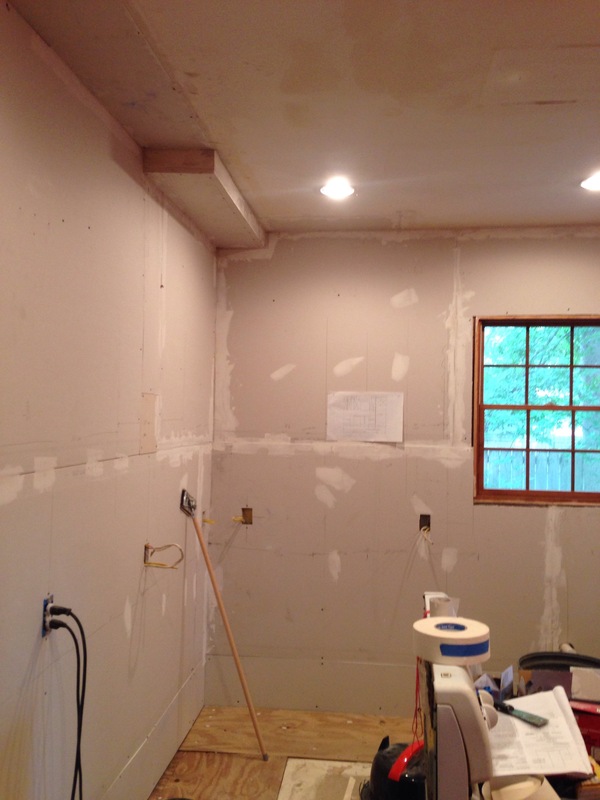 Moving on to positives, we got the drywall up, subfloor in, electrical worked out, and wallpaper mostly off. More mudding today and then we can get to fun stuff like hanging cabinets, painting, and laying floor. The box to hide the pipe. Chili pepper wallpaper border all gone except for some paste. Posted July 17, 2015 by Tim Lepczyk & filed under House. Most of the plumbing is complete. However, leaky pipes in a doctor’s office took precedent and the plumbers left after lunch. It’s kind of like being in the emergency room and watching worse cases being treated before you. Hopefully, Monday they will finish the job. In the meantime, we have no water at the house and I’m stressed about all of the delays. Posted July 16, 2015 by Tim Lepczyk & filed under House. The plumbing situation has been frustrating, but work is happening and we no longer have a four inch drain running down the kitchen wall. I haven’t been this excited about plumbing since Super Mario Bros.
Posted July 13, 2015 by Tim Lepczyk & filed under House. 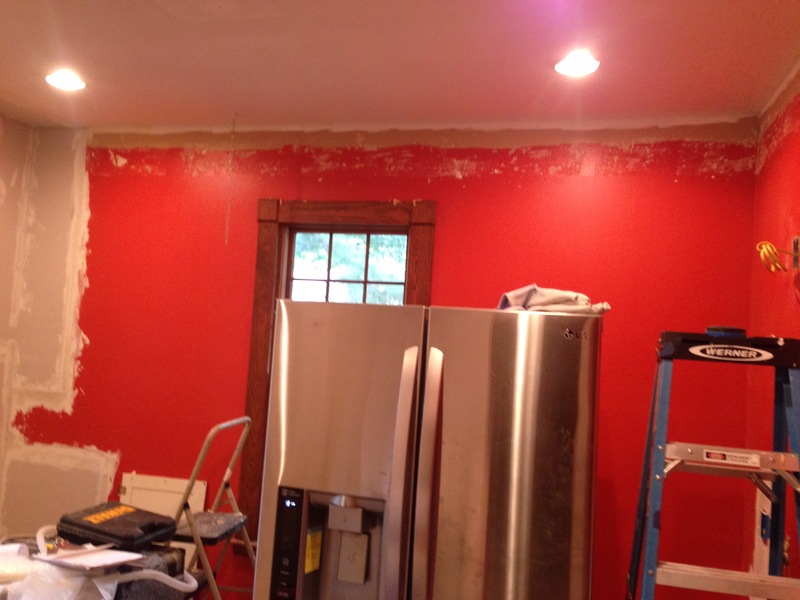 This is how our kitchen renovation is going.